In what was completely a team decision, and not the forgetting of an alarm set the previous day, we rose and… erm… shone the following morning at 0600. A quick breakfast of cereal purchased at Coles the previous day (don’t assume we’re on some health kick, the only cereals available were Cocoa Pops and Nutri-Grain…) and we were heading down to the sub-terminal to see what interesting things would be happening before we headed back towards Sydney. 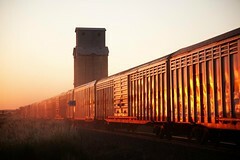 Arrival at the grain terminal at approx 0645 yielded very little in the way of interest. Aside from a new rake of grain wagons that had arrived from Enfield the previous night (the second Westons Milling rake), there was not a loco to be seen! 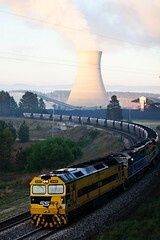 It was worth noting the endless procession of loaded grain trucks streaming in and out of the sub-terminal (most of whom managed to neglect to stop at the level crossing at the entrance to the yard) – there’s plenty of grain to be moved at plenty of silos across NSW after a massive year for our farmers. The first hint of action was at 0700, when a loud whistle blast at another crossing heralded the arrival of 8831N empty Manildra feeder service from Manildra to Parkes behind 48160, X36 and 48108. Interestingly, despite a large number of X Class being based in NSW, X36 is only the only “first series” member of the class to have made it to the state. 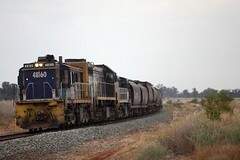 As the train order for this train obviously only extended to the Yard Limit board at Parkes, we made our way up the line for another shot, before following the train into town. Shortly after arriving at the Eastern end of Parkes Yard, to see where 8831N was headed for, we noticed a couple of export rakes had arrived from Cootamundra over the course of the morning. One was headed up by two 81 class, while the other, departing for the sub-terminal at 0729 was headed up by G540, 48165, 8169 and 8176. G540 and 48165 had arrived in town the previous evening with the empty Westons rake, and were stabled in Parkes Yard after dropping their wagons off. Given the nature of Train Order safeworking, it must have been easier to attach the two locomotives to the front of the empty export rake and drop them off at the sub-terminal (where the export train was due to load anyway). Acting on a tip from our mate Tim, we headed south of town on the Newell Highway – the empty Manildra feeder service was headed to Temora to load today! While waiting for 48160 and train, we also recorded the northbound passage of 8144 and 8109 on 9827N empty wheat from Cootamundra, passing our vantage point at 0835. 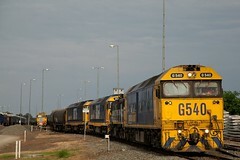 With a 9829N also having departed Cootamundra that morning, that makes four empty rakes to be loaded in Western NSW! The season is indeed booming! 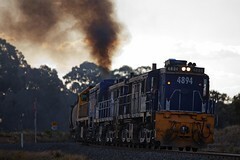 With a new Train Order to Forbes, 48160, X36 and 48108 were seen crossing the Newell Highway as train 8331N at 0920. We followed them as far as Forbes, before reluctantly deciding to head east, and homeward bound. A short diversion to Manildra, to hopefully capture MM01 (which was hiding when we passed through the previous day) coincided with the arrival of 9837N empty flour train from Bomaderry behind 8136, 8106 and 8125. No sooner had the train stopped, then the points were thrown over and the rear wagons were reversed into the flour loading shed. The train was quickly divided, and MM01 swooped in to begin loading the wagons – perfect timing on our part! With MM01 safe on the memory card, we continued east, with a planned shot at Orange of the Dubbo XPT service adjusted to Sprinhill due to late running (most likely due to the trackwork in Western Sydney). Aside from the XPT, the only freight running on the west was a late running 1865N from Cooks River. 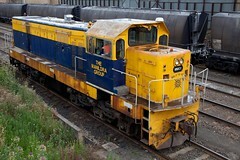 Our poor run of luck with this train continued, missing the shot by mere seconds at Raglan. We consoled ourselves in that the same grubby GL Class were leading the train (we didn’t catch the numbers), and that we had not missed the more exotic (and, arguably more interesting) 14 Class locomotives. Finally, a stop was made at Lithgow to grab a quick shot of the rear of 4204 (stabled in the yard), as well as a quick peek at the “new” carriages that had recently arrived from various sites around the state. From the glances we had, there were a couple of Southern Aurora/Brisbane Limited type cars, what appeared to be an Indian Pacific dining car, as well as a pair of OAH and OAS cars, with the latter two cars in the tuscan and russet livery. One would assume that these cars have been sourced and purchased with the intention of becoming part of the operating fleet of the new tourist train “The Blue Zephyr”, with more air conditioned cars having been repainted into an eye-catching deep blue scheme. With rumours circling that the two ex Patrick PortLink 49 Class (4903 and 4906) are to be painted in a matching scheme, only time will tell what the future holds for this fascinating collection of rolling stock. I have no doubt that a lot of enthusiasts will disagree, but there is a place for air conditioned rolling stock tours, as it discourages people sitting in corridors hanging out windows, video camera in hand and tongue outstretched, and encourages like-minded people sitting in a compartment discussing topics of interest. For the complete selection of photos taken while out west, you can find them on my Flickr. Further photos taken by Todd Milton can also be viewed on his Flickr. (News to Me) Last Run of the 86 Class? Coote Industrial (owner/operator of Southern & Silverton) today railed two of their final 86 class west into Lithgow, possibly for scrapping. Cs5 lead the two 86 Class (8609/8622) as well as a short rake of container flats from Enfield to Lithgow today. Unfortunatly, I was unable to get photos of the movement.